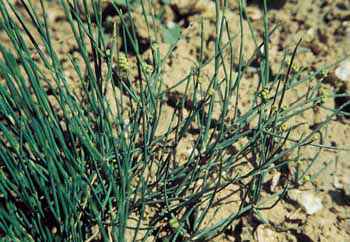 (Chinese ephedra; Cao ma huang) A long time holy grail for Richters, we are very pleased finally to be able to offer seeds of the true Ma huang from Inner Mongolia. Ma huang is a powerful stimulant herb containing the alkaloid ephedrine, the main inspiration for today’s popular over-the-counter antihistamine drugs. Purified ephedrine is very potent, and a common North American practice of adding it to diet formulas is potentially dangerous because ephedrine can raise blood pressure if used over a long period, and can even cause cardiac arrythmias. However, when used in its native, non-purified form, the dried herb is much safer and very popular in traditional Chinese medicine for dispersing conditions characterized by wind and cold, such as chills, fever, headache, cough and wheezing. Very hardy; prefers dry, well-drained location with full sun exposure. Ht. 30cm/12in. NOTE: Because of widespread abuse of stimulant and weight control products made with purified ephedrine the FDA banned the sale of products containing ephedra in 2004. This is an unfortunate overreaction because the herb in its native, non-purified form is one of the best remedies for colds and asthma, used for thousands of years in China. Fortunately growing the herb in your garden for personal use is not affected by the ban and is still legal.